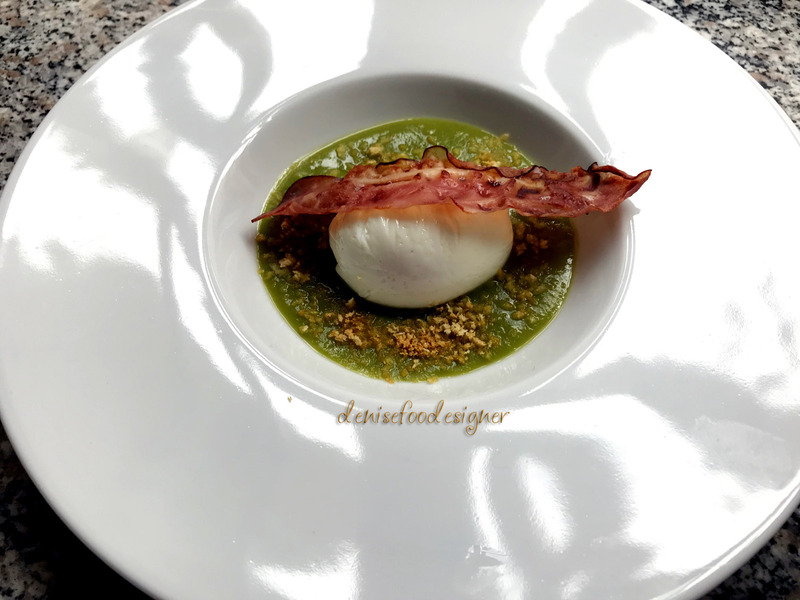 Who says that the poached egg is difficult to prepare? If you have never tried to cook it, try the following recipe. Few steps to follow and you will have an excellent result. It’s necessary to use the fresh eggs, because with this cooking technique the yolk will remain raw. How can you check the freshness of the egg? Simple, just soak it in a container filled with cold water for a few seconds: if the egg floats, it means that the egg is old; conversely if it remains on the bottom means it is very fresh. Do you want another advice? Respect the cooking time, otherwise you’ll obtain an hard-boiled egg or almost.. Delight to try this technique which is fast and very healthy! Peel the shallots and cut into slices not too thin. In a pan fry it with two tablespoons of oil for a few minutes. Then add the peas, stir and pour a few tablespoons of broth. Cook over medium heat for about 15-17 minutes. When the peas are tender, remove from heat and shake it with an immersion blender or with a food processor. Pass the cream through a sieve: so you will get a very smooth cream. You can add a little broth while blend the vegetables. This step could change the texture of the cream: if you add much broth, the cream will be liquid, instead if you add a little broth the cream will be thick and dense. Season with salt and pepper. Remove the edges from the sandwich bread, after chop it with the remaining ingredients in a mixer. Then sauté the bread crumbs in the pan for a few seconds. Remove from heat and set aside. Turn off the heat and arrange on a plate. Let them cool. In another hot pan roast the slices of bacon, these ones must be golden. Turn off the heat and allow to cool on a plate. Now it’s the time to prepare the egg: first take a sheet of plastic wrap and place it on a cup, brush the surface with some olive oil, then shell the first egg and put it on this sheet. So seal the film gently with string or tying a knot with the same plastic wrap (but first you have to delete the air inside). Bring to a boil a skillet full of water and cook the egg about 4 minutes. Drain and open gently the plastic wrap. Proceed in the same way to cook the other eggs. 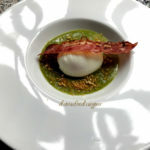 Pour the cream of peas into a dish, put the egg gently on this cream and place the slice of crispy bacon on the same egg. Decorate with bread crumbs around the egg .